Photo credit: Hajime Nakano on Flickr. average discharge 3 m3 / sec. Lake Akan (Akan-ko), probably the most famous Japanese lake, is found in the North-Eastern part of Hokkaido Island, in a caldera-type volcanic crater which is guarded by 2 volcanic peaks: Oakan-dake (height: 1,371 meters) and Meakan-dake (height: 1,503 meters). Lake Akan was formed by volcanic activity approximately 6,000 years ago. The lake’s fame is due to an aquatic plant named by the Japanese "marino" (Cladophora in botanical terms), which is actually an aggregation of algae, up to 15 centimeters in diameter. Marino, besides the fact that it lives for a very long time (up to 300 years), has an unusual life cycle. It lives at the bottom of the lake and surfaces only when the water is perfectly calm and lightened by the sun’s rays. Marino can only be found in lake Akan, even though many other lakes in the region bear the same thermal and chemical characteristics. Botanists’ attempts at introducing it in other similar lakes have failed. But marino definitely used to live in better times. The lake used to have a clarity of 8-9 meters in the 1930s, but due to pollution from local resorts, the transparency has decreased to 3-4 meters. As expected, the plant and lake Akan also share a legend. It’s said that in the nearby village, which was once inhabited by the ainu population, lived a girl named Marino, who loved a man who was poor, like herself. When everything was prepared for the young couple’s wedding, a samurai from the castle on the shores of lake Akan showed up and kidnaped her. Marino, in her despair, threw herself into the lake and became a flower. When the weather is nice and the water is still and warm, Marino comes to the surface to meet her lover. This plant, with her unique biology and shrouded in legend, manages to attract many visitors. People come from all over Japan to see Marino. Those who succeed go back home happy and with the belief that everything will go great for them. This is why the lake is also known as "the happiness lake" in Japan. The lake is frozen from December through April and has 4 islands: ÅŒjima, Kojima, Yaitai Island and ChÅ«rui. Since the lake is situated in a volcanic region, hot springs are welling up. 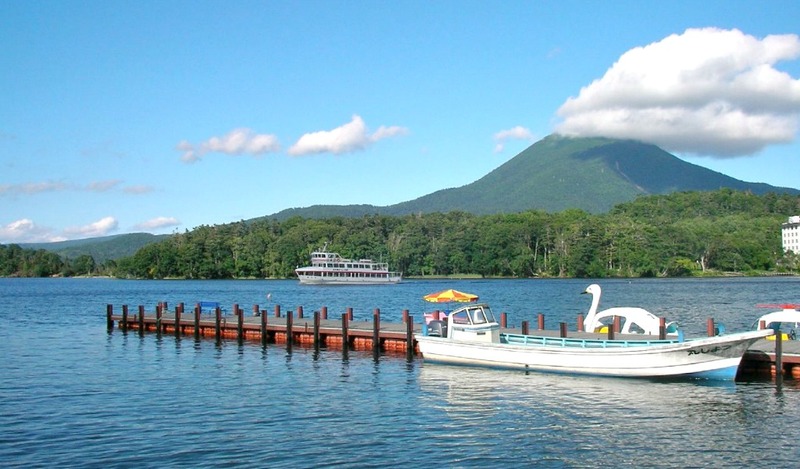 You can take full advantage of them in the hot spring resort Akankohan, which is the only town around the lake. A boat can be taken to Chuurui Island to see Marimo in nature. Nearby, the largest Ainu village in Hokkaido can be found, Ainu Kotan, where two Ainu men and a big owl welcome you at the gate. For Ainu people, bears, eagles and owls were the mountain gods. Submerged macrophytes: Potamogeton crispus, Hydrilla verticillata, Myriophyllum verticillatum, Vallisneria gigantea. Phytoplankton: Melosira italica, Asterionella formosa, Synedra sp. Zooplankton: Daphnia longiremis, Bosmina coregoni, Eurytemora affinis. Fish: Oncorhynchus nerka, Cyprinus carpio, Carassius sp., Hypomesus olidus, Leuciscus hakonensis. 24 mammal species and 65 bird species live around the lake. They include large mammals like the Eurasian brown bear and yezo sika deer, but also endangered bird species like the black woodpecker and blakiston’s fish owl. Lake Akan is mainly used for tourism, recreation, and for its fisheries. The lake’s mirage, the plants (evergreen mixed conifer forests, rhododendron, azalea), animals (bears, ezo deers, Hokkaido squirrels, ezo red foxes, swans, white rabbits) and the volcanic landscape, have all led to the establishment of the Akan National Park in 1934, which covers an area of 905 square kilometers. The lake is also a Ramsar site.